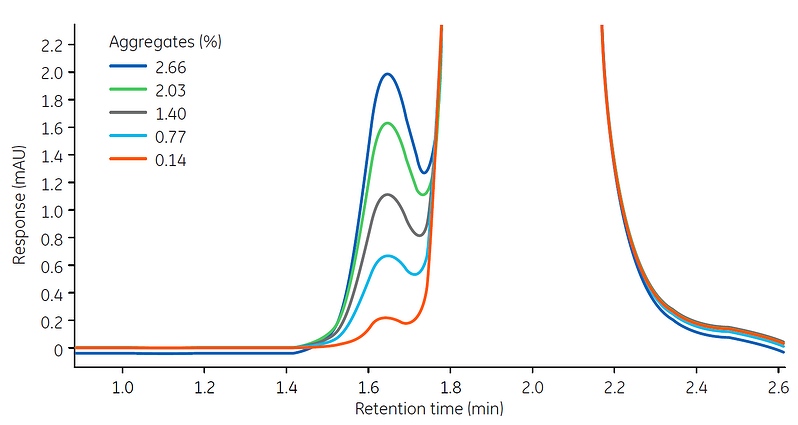 Screening for mAb aggregation is important in the production of mAb. When performing aggregate analysis on mAbs there is often no issue when the aggregate level is above 1%. At lower levels, however, issues can arise in integration of the aggregate peak. The figure below shows that it is possible to determine ≥ 0.1% aggregate with 4-min run time on Superdex 200 Increase 5/150 GL SEC column. Thus, this column is a good screening tool to evaluate conditions for mAbs. Screening of mAb aggregates on Superdex 200 Increase 5/150 GL at runtimes down to 4 min. Column: Superdex 200 Increase 5/150 GL; Sample: mAb; Sample volume: 5 μL; Flow rate: 0.75 mL/min; System: HPLC system. Superdex 200 Increase SEC columns are for high-resolution analysis of mAbs and other proteins with Mr~ 10000 to ~ 600000. Superdex 200 Increase is an agarose-based resin that is alkali resistant and supports cleaning-in-place (CIP) procedures which can increase column lifetime.